Bog Witch: Init +6; Atk claws +3 melee (1d4 + life drain); AC 14; HD 2d6; MV 40’; Act 1d20; SP Un-dead traits, life drain; SV Fort +0, Ref +3, Will +0; AL C.
Bog Witches first appeared in the Bogwood Swamp five years ago when the Red Moon of the Calamitous Whisper appeared in the night sky. When the moon swelled and blood rained down on the area those that were caught in the deluge were twisted into these horrific monsters. Bog Witches are extremely agile, but the features of their once living souls have now waned, leaving them emaciated and feral. 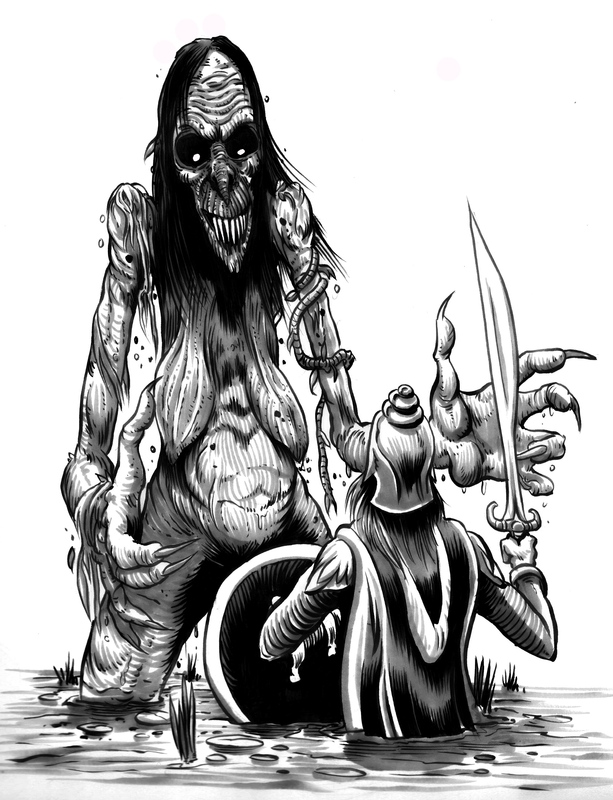 Bog witches have long claws that they use to rend flesh from bone. Those touched by a bog witch must succeed a DC 12 Fort save or lose 1d3 Stamina (temporary). If a target rolls critically fails on their Fort save they lose 1d6 Stamina permanently. Bog witches like to lurk just beneath the water and wait for a meal to pass by. Those that venture out into the swamp with their barges prospecting for lignite live in fear of the bog witches, knowing that at any time one may burst from the water and onto their boats, bringing only death and suffering. This entry was posted on Saturday, January 3rd, 2015 at 12:50 pm	and posted in Dungeon Crawl Classics, Hubris Campaign Setting, Monsters, Role-playing. You can follow any responses to this entry through the RSS 2.0 feed. « Environmental Hazard Table- Snow- and the 600th Post for Wrathofzombie!